Jaffa, the ancient Mediterranean port city from which the biblical prophet Jonah fled, is putting on a new face. The sprucing up of both private and public areas extends even to the Jaffa Flea Market, a jumble of shops and stalls where Jewish and Arab vendors offer old silver and brass, brightly colored rugs, nargila pipes, mother-of-pearl inlaid cabinets and vintage clothes as well as Far Eastern imports, used furniture, restaurant equipment, bicycles and, well, junk. In the market, streets and sidewalks have new brick paving, metal benches and conical lamps; even the sewage system has been upgraded. Nineteenth-century buildings, with shops on the ground floor and apartments above, are being renovated, many retaining their Ottoman-period arched doorways and porthole windows. And trendy cafés have sprouted, so weary shoppers can sip a latte as they crow over their bargains. Jaffa was long the holy land’s bustling portal, the “bride of Palestine” and “darling of the waters” through which every pilgrim and immigrant passed and where many decided to stay. On the eve of the 1948 War of Independence, it was the largest Arab city in Palestine, with some 100,000 residents, only 30,000 of whom were Jews. Now it has fewer than 50,000 residents, only one-third of them Arab. Today, Jaffa is scrambling to catch up with Tel Aviv, which set out 100 years ago to be its northern suburb but became its dominant sister. After 1950, when the two cities merged into one as Tel Aviv-Jaffa, Tel Aviv went on to become one of the richest urban areas in the country while Jaffa became one of the poorest. And everywhere, it seems, gentrification is gaining momentum. Some old buildings are getting facelifts, others are being completely replaced, a hospital and a jail will be turned into boutique hotels, the port area is undergoing a transformation to an entertainment center and even the notorious Garbage Hill is being moved to make way for a park. The flagship project is the renewal of Clock Tower Square, which borders the flea market, and the area around it. The goal of this project, Peled says, is to entice visitors to see more than the already popular Old Jaffa and to enjoy what was, in the 19th century, the administrative and commercial heart of the city. As a visitor, you know you have left Tel Aviv and entered Jaffa when you reach Clock Tower Square (officially named Jewish Agency Square, but no one calls it that). Tel Aviv’s beach promenade will bring you there on foot, and the seaside Kaufman Street will get you there by car. Old Jaffa, including the port area, lies to the west of the square, and the flea market lies to the east. Jaffa’s main residential areas extend to the south. Clock Tower Square, once the city’s main market, is also the point from which newly arrived travelers once set out in horse-drawn carriages called diligences on one of three historic roads. Plaques on new stone signposts explain that one road, now named Beit Eshel, led southeast to Jerusalem; that the second, now named Raziel, led northeast to Nablus, Akko and Damascus; and that the third, today named Yefet, led south to Gaza and Egypt. Toward the end of the 19th century, the Ottomans, who had ruled here since 1517 and were bent on modernizing and expanding Jaffa, tore down the old city walls and erected new public buildings in the square. They also built new neighborhoods—Manshiye to the north (which was destroyed after 1948) and Ajami to the south. The clock tower itself was built in 1902-03 near the Mahmudiye Mosque, also known as the Great Mosque, which still stands. The tower was one of seven that went up in Eretz Yisrael to mark the jubilee of the accession of Ottoman Sultan Abdul Hamid II. With its sandstone walls, arched stained-glass windows and gabled green copper roof with two clocks and a bell, the three-story tower would look perfectly at home on a European church. Its preservation in 2001 by architect Eyal Ziv, who is in charge of renewing the entire square, signaled the start of the 10-year rebuilding project. Facing the tower to the east stand four massive Ionic columns topped by an equally massive lintel, behind which one can see the new Rozet Café (21 Eilat Street; 011-972-3-516-6477). The columns are part of the façade of the saraya, the Ottoman (Turkish) government building erected in 1897. A Berlin-trained Jewish architect, Baruch Papiermeister, designed the building in neoclassical style, befitting the importance of Jaffa as the gateway to the Holy Land. It was in the saraya that the Ottomans surrendered in 1917 to the conquering British, who then used the building as a town hall. In 1947, shortly before leaving Palestine, the British handed over the saraya to local Arabs, who used it as their military headquarters. It was blown up in 1948 by members of Lehi, one of the armed Jewish underground groups, and remained in ruins until recently. In an interesting twist of history, the renewal of the saraya’s façade represents a return of a Turkish presence to Jaffa. The rebuilding is part of a $1.5-million project footed by the Turkish government. Another part of that project involves the renovation of the adjacent Ottoman governor’s mansion, probably built in the 1880s. This salmon-colored three-story structure with porthole windows just below the roof is being turned into a Turkish cultural center, a model for such centers around the world. It has a small museum of Turkish culture, a film-screening room, a library, a tourism office, an Internet café, apartments and a lobby that will be used for various events. The second floor has rooms for ceramics and embroidery classes. The ground floor houses the popular Yoezer Wine Bar (enter at 23 Raziel Street; 972-3-683-9115), opened in 1995. Adjacent shops sell imports from Morocco and the Far East. To explore the flea market, follow Beit Eshel Street east from the square, then turn right at Yehuda Meragoza Street. On your left is the shop of the Shmueli Brothers, who sell old brass and silver. At the next corner (Yehuda Meragoza and Olei Zion Streets) stands the new kosher Italian restaurant Il Yaffo Café (972-3-518-1988;http://cafeyaffo.rest-e.co.il), in a building that formerly housed an antiques shop. Or, instead of turning right at Yehuda Meragoza, continue east on Beit Eshel, passing an old mosque on your left and bearing left on Olei Zion until you reach the intersection with Sderot Yerushalayim. 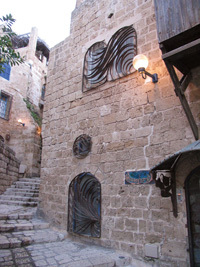 You will be in front of an old Orthodox synagogue, Hama’or, and facing a plaza with a circular fountain, behind which is the Reform movement’s Ruth Daniel Center and Guest House (972-3-682-7700;www.beit-daniel.org.il). It opened in 2007 and offers convenient and relatively inexpensive accommodations. Returning to clock tower square on olei zion, take a small detour—a left on Amiad and a left again on Rabbi Hanina Street—to see a large number of gentrified houses. Many of the homes formerly belonged to wealthy Arab families and have been renovated and subdivided. Back at the clock tower, go to the southern tip of the square to line up for one of the savory pastries sold at the Arab-owned Abulafia bakery at 7 Yefet Street. A sign on this Jaffa landmark says it was established in 1879. But the Abulafia family, said to be one of the wealthiest in Jaffa, is moving with the times and now also has a fancier sit-down restaurant across the street. Now walk around the square to the massive stone kishle, the Ottoman jail, surrounded by part of the old wall; it is just west of the clock tower and has an elaborate arch at its entrance. The kishle is currently being transformed into a boutique hotel. From there, as you follow the seafront promenade around the old fortifications and continue south, on your right you will see a tiny beach. A bit farther south, on your left, are new luxury apartments with large arched windows and wooden balconies built in what was once a monastery. Across the street, amateur fishermen while away the day, but soon this area will be humming with visitors in search of entertainment. Straight ahead is a hangar that the city is transforming into a commercial and cultural center. And beyond that is the port from which fisherman still go out every morning. Pause for a moment and gaze out to sea at the large rock topped by an Israeli flag—Andromeda’s Rock. A Greek myth attached itself to Jaffa, perhaps because it involves a sea monster, as does the story of Jonah. According to the myth, Perseus, returning on his winged steed Pegasus to Olympus after slaying Medusa, flew over a rock near Jaffa on which Princess Andromeda was chained, about to be sacrificed to a local sea monster. After slaying the sea monster and rescuing the princess, Perseus received Andromeda’s hand in marriage. From the port, follow signs to Kedumim Square or, a bit south of that, take an unmarked set of steps uphill. These will lead you through winding alleys, the hallmark of Old Jaffa. As you ascend you will see churches, mosques and boutiques. When you reach the top, you will be standing on Tel Yafo, or Jaffa Hill, whose strategic importance as a lookout led one army after another to conquer it. Here you will find the visitors’ center (972-3-518-4015; travel@oldjaffa.co.il); the Museum of Antiquities of Tel Aviv-Jaffa and adjacent bathhouse (10 Mifratz Shlomo Street; 972-3-682-5375); the Arab-Hebrew Theatre (972-3-518-5563; http://arab-hebrew-theatre.org.il); and the Ilana Goor Museum (4 Mazal Dagim Street; 972-3-683-7676; www.ilanagoor.com) as well as a profusion of galleries and restaurants. From Kedumim Square it is a short walk south to Andromeda Hill (972-3-683-8448×5; www.andromeda.co.il), a gated community overlooking the sea and perhaps the best-known gentrification project in Jaffa, partly because it has defied a court order to allow access to public land on its premises. This complex, planned as 270 units on Louis Pasteur Street and offering holiday apartment rentals, was built on land belonging to the Greek Orthodox patriarchate and is surrounded by one of Jaffa’s poorest areas. It was marketed as an ultramodern “city within a city,” and thus cut off from the rest of Jaffa, but simultaneously, and paradoxically, as an authentic Orientalist Jaffa site. Some 70 percent of owners are well-heeled Israelis. On Yehuda Hayamit Street, where the old Jewish cemetery is located, and Sha’arei Nicanor Street, both of which run west from Yefet to the sea, there are many more residential projects for the well-to-do, including the Maronite Quarter under construction, named for the nearby Maronite Monastery. Continue south on Kedem Street and, on your right, on the seashore, is Israel’s largest renewal and recycling enterprise, the Jaffa Slope project. Garbage Hill, a million tons of construction debris and other refuse covering some 55 acres, which for decades cut off the Ajami neighborhood from the sea, is being carted away for recycling. A park with a gentle slope will restore Ajami’s view of the sea and will incorporate a continuation of the beach promenade and a bicycle route. Farther south on Kedem Street stands the sleek, green concrete-and-glass Peres Center for Peace (972-3-568-0680; www.peres-center.org), sandwiched between a Muslim and Christian cemetery and a park. Besides housing the personal library of President Shimon Peres and documents related to the peace process, the center hosts educational and peace-building activities for children and adults. On the face of it, all this development would seem to be a good thing. But not everyone is pleased. Take, for example, three Arab residents sitting outside an Arab pastry shop on Yefet Street, where outdoor murals depict the cheese-based knafe specialty served there and snow-capped mountains that could easily be in Switzerland. Two of the men listen intently as the third reads aloud from Yediot Ahronoth, a Hebrew-language daily. A real-estate developer is quoted as promising to keep Arabs out of his new project in Jaffa. “I can guarantee 100 percent that Arabs won’t be able to buy there,” the developer told the paper. Sami Abou Shehadeh, 33, is a doctoral candidate in history at Tel Aviv University and a longtime Jaffa resident who has been leading tours of the area for 10 years. According to him, the gentrification is partly the result of Tel Aviv driving its residents south in search of more affordable housing. But it is not providing jobs for Arabs nor is it offering them much-needed housing. Many of the new apartments are too small and expensive to meet the needs of the Arab population. And between the 1980s and 1990s, prices rose fivefold. Peled, however, says emphatically that “Jaffa is not being Judaized…. Where Jews leave other parts of Jaffa, Arabs move in.” He also points to projects benefiting the Arab population, such as the Ajial High School, dedicated to academic excellence.